The Dopest Lawyer is based in San Marcos, Texas, at least according to a recent trademark application. 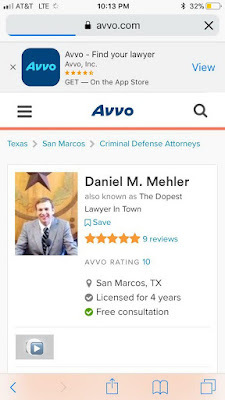 On January 4th, a lawyer named Daniel Mehler filed an application to register THE DOPEST LAWYER IN TOWN as a trademark with the U.S. Patent and Trademark Office. The application covers "legal services; legal consultation services" in Class 45. According to the application, Daniel has been using this designation as a trademark in interstate commerce at least as early as January 1, 2014. His firm's website indicates his firm is "dedicated to all things cannabis." The Dopest Lawyer...get it? While applicants selling marijuana, marijuana extracts, and THC-infused substances are routinely denied federal trademark registrations (regardless of the state in which such applicants are located), this application is only for legal services, which aren't, obviously, illegal. To qualify for a federal trademark registration, the use of the mark in commerce must be lawful. See TMEP 907. Because marijuana is classified as a Schedule I controlled substance under the Controlled Substances Act (21 U.S.C. 801-971), goods or services related to the sale or transportation of marijuana violate federal law. Therefore, the U.S. Patent and Trademark Office will refuse to register marks covering those goods and services (like this application covering "desserts infused with cannabis"). Goods or services that don't involve the sale or transportation of marijuana, but are nonetheless related to marijuana, can still be registered (like this registration covering a creative agency that serves the cannabis business marketplace). Will The Dopest Lawyer in Town receive a federal trademark registration for his tagline? Pay attention to this application to find out. To all the other lawyers out there - unfortunately it looks like you might have missed the opportunity to coin this term for yourself.